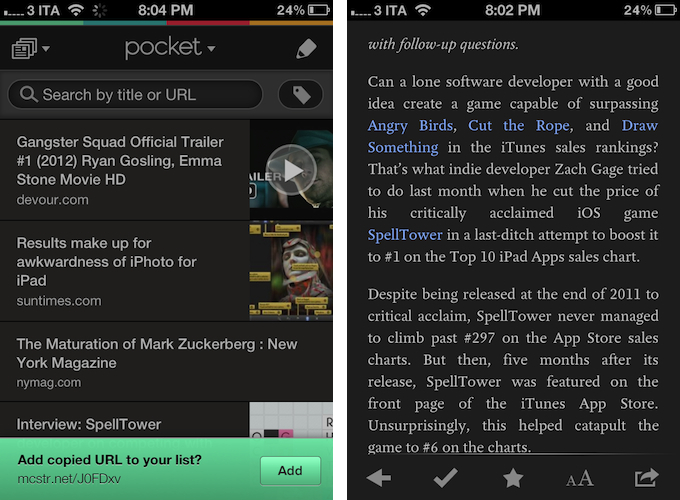 One year ago today, Read It Later was reborn as Pocket, transforming into a service that emphasized saving anything, not just articles, for later. 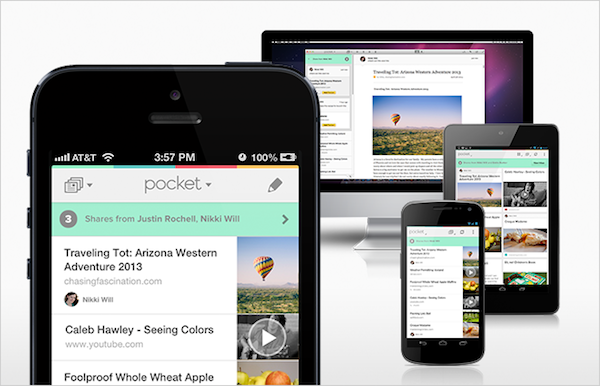 For the past year, Pocket has rapidly iterated while landing on numerous devices between Android and iOS, even arriving on Apple's desktops and laptops with a native Mac app. 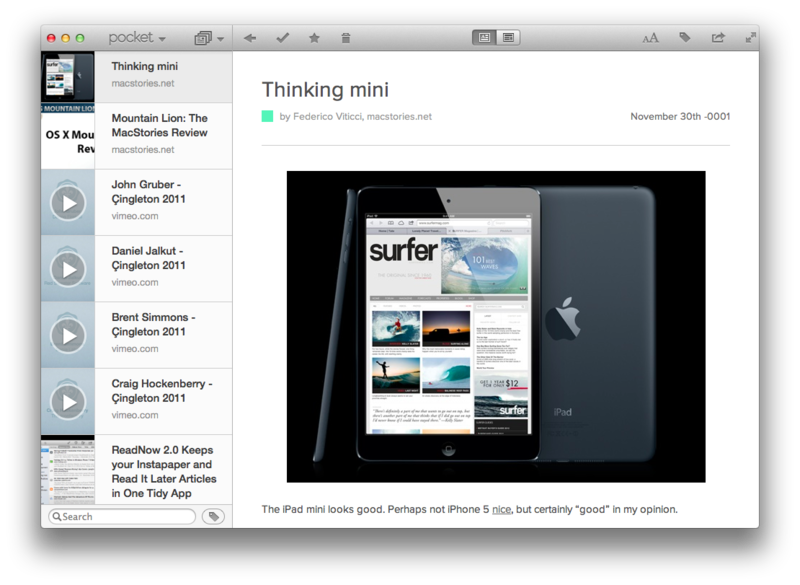 Recently, Pocket made it even easier to save stuff for later thanks to Feedly, WordPress, and HootSuite integration. With more than 8.5 million users who've saved more than 300 million articles in the past year, Pocket has also launched Pocket for Publishers, giving creators on the web an easy way to gain insights on the lifespan of their content. To celebrate their one year anniversary, Pocket is launching Send to Friend, a brand new feature that goes beyond sharing to Facebook, Tumblr, and Twitter. 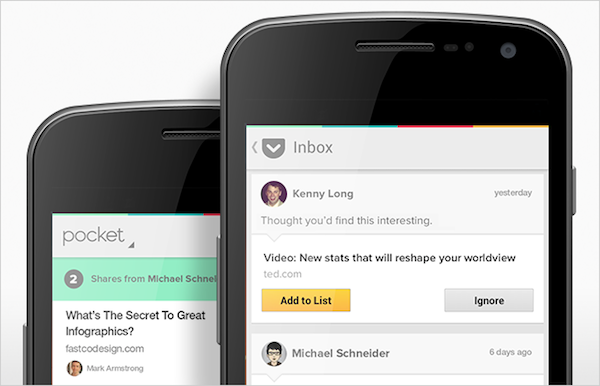 Send to Friend improves upon email sharing, which Pocket found people used more than twice as often as sharing to social networks. 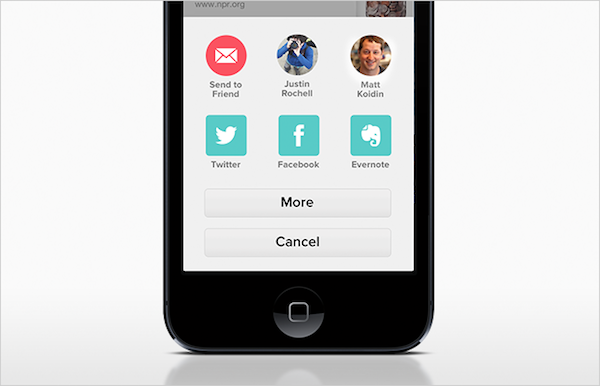 Send to Friend allows for better interpersonal sharing between friends and family. Content can be shared with a comment and a highlighted quote, and if the person receiving the shared link also uses Pocket, they'll receive a Push Notification and the content in their inbox. Anyone who receives a link can save it to their list of stuff to view later, or simply ignore it. Lastly, Pocket improves upon their Share Menu by automatically bubbling up icons and making more convenient shortcuts to often used services and friends that you share to. If you find yourself sharing to Twitter and to a couple of particular friends more often, the Share Menu will place shortcuts to them first. Of course, you can always get to seldom used services at any time. Pocket with Send to Friend is available as a free download in the App Store. I typically catch up on my reading list late at night, but that doesn’t mean I don’t enjoy the occasional cup of coffee and longform article during the day. Readtime is an interesting idea for those who like to “get things read” in short or long reading sessions, depending on how much time they have available. Unfortunately, while promising, Words isn’t there yet. Words looks decent when it’s focused on text (generated by the Instapaper parser) in full-screen mode, but everything else is pretty buggy, unstable, and unfinished. Speaking of Pocket, the best way to access a Pocket (or Instapaper) queue on OS X, Read Later, has been updated to include video support for the (rebranded) Pocket service inside the app. With the Pocket parser now capable of fetching videos from more sources, Read Later can, for instance, display YouTube or TED videos inline through your preferred reading style. Based on traditional RSS apps, ReadNow organizes your Instapaper and Read it Later articles for offline access, optimizing articles for a cleaner reading experience on your Mac. ReadNow features a custom article view that lets you style the article, change the line height and article width, and customize the font. Archiving and liking articles in the app will push those changes to the respective service in realtime. Unlike your favorite iOS apps, ReadNow lets you drag and drop articles into folders and tags to quickly move them from the reading list. I particularly appreciate Read Later's drag & drop support to easily move the Instagram photos I send to Pocket (via IFTTT) to a specific tag, and I use the app's hotkey to quickly send a link from my pasteboard to Pocket. 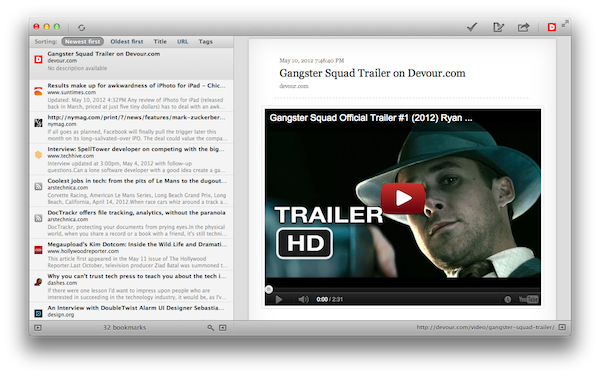 Support for video makes for a nice watching experience on OS X, and you can get the app for free on the Mac App Store. Following a massive 4.0 update that saw Read It Later turn into Pocket (our review), founder Nate Weiner told us the new platform they had built would allow them to "iterate and move faster than ever before". Less than a month after Pocket's launch, a major 4.1 update has been released today, bringing some new features and several refinements to the app that wants to make "save for later" mainstream. In my original review, I noted how there was no way to manually add links into Pocket, either with a "+" button or through automatic clipboard detection for URLs, like Instapaper does. Pocket 4.1 introduces a subtle, good-looking dialog for added URLs that gracefully slides up from the bottom of the screen every time you launch Pocket with a URL available in the iOS clipboard. I still think Pocket should also have a manual button to enter new URLs, but the addition of clipboard integration improved my app-switching workflow nevertheless. The most important changes in Pocket 4.1 are visual, as the app adds a bunch of new options to customize the look of the reading view and improve readability in different settings. New dark and sepia themes focus on high-contrast reading, and an application-wide dark option has also been enabled to make the UI easier on the eye for those who like to use Pocket at night. I like the new dark theme, as it really helps in navigating the inbox when I'm using Pocket while my girlfriend is sleeping and I don't want to wake her with my iPhone's display. Plus, the overall design of the theme is reminiscent of the old Read It Later in some way, which is a nice cameo. I am no fan of Sepia, but I guess it's good to have options. In the reading view itself, the Pocket team increased the maximum font size supported by the app -- good for visually impaired users -- and created a new pagination mode that lets you conveniently read long articles as single pages. Switching between "classic mode" and pagination isn't a setting -- rather, you can activate "page flipping", as the team calls it, by swiping left or right on screen. The effect is pleasant, responsive, but I prefer to read my articles as #longreads I can scroll. A minor change that I am deeply enjoying in version 4.1 is support for Devour and TED. For those not familiar with Devour, it is a website that collects "awesome videos" from YouTube every day, embedding them in a clean, neatly designed layout that is easy and fun to browse every day. Pocket 4.1 saves Devour.com URLs as video thumbnails, which support the fancy video player introduced in version 4.0. Pocket 4.0 was a great app, but the improvements made to the service lately and this new version have turned the product into an experience that fits my reading and watching habits even more. 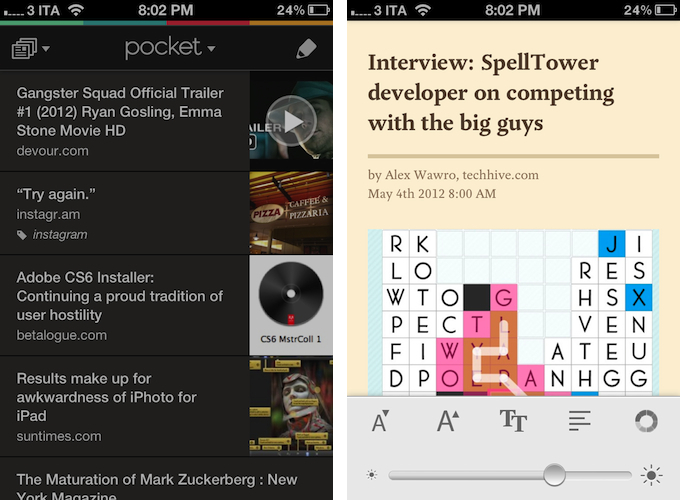 You can find Pocket 4.1 on the App Store. Earlier this week, Pocket updated its ultra-handy bookmarklet and Chrome extension by adding tags after you've saved something. Along with this, the Chrome extension also received a useful shortcut (OS X: CMD+Shift+P, Windows: Ctrl+Shift+P) for even quicker saving. This morning as I was drinking my coffee and reading my RSS/Twitter news I updated the Chrome extension, and then tried the new key combo... and tried... and tried. The only thing Chrome was doing was bringing up the Print Preview dialog box. Upon searching some Google Groups pages, I found an easy fix to disable the Print Preview box and let Pocket use its new shortcut as intended. Directions: Type 'about:flags' in Chrome's address bar and locate the 'Disable Print Preview' option. Click the underlined 'Enable' to disable Chrome's print preview, then restart Chrome. Now CMD+Shift+P (OS X) or Ctrl+Shift+P (Windows) should activate the Pocket key command. Personally, I'd love for Pocket to add user-customizable shortcuts, so that users will have the option to use something else besides the default command to avoid this problem entirely. 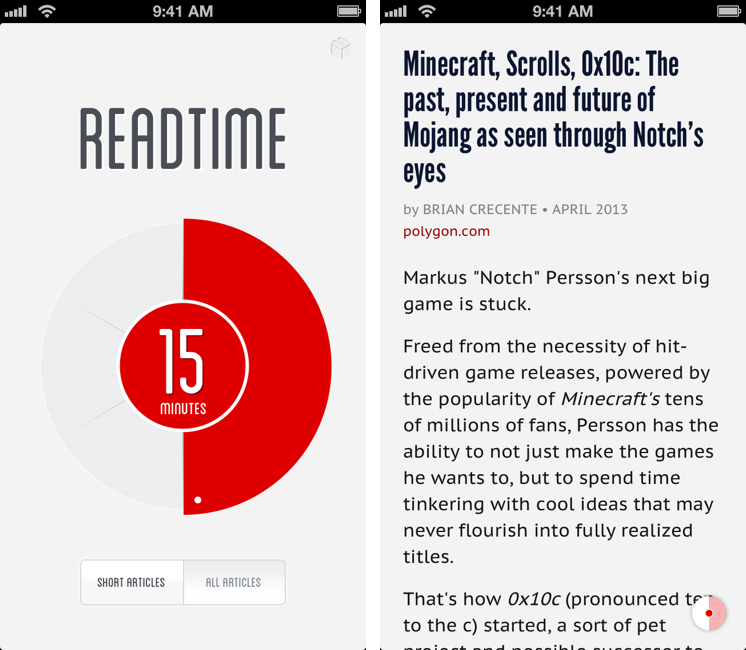 By the way, if you haven't checked out Pocket yet, read our review.